Are you determined to get a jumpstart on the gardening season this year? In this February Garden Guide, find out what to do this month to have a successful garden. 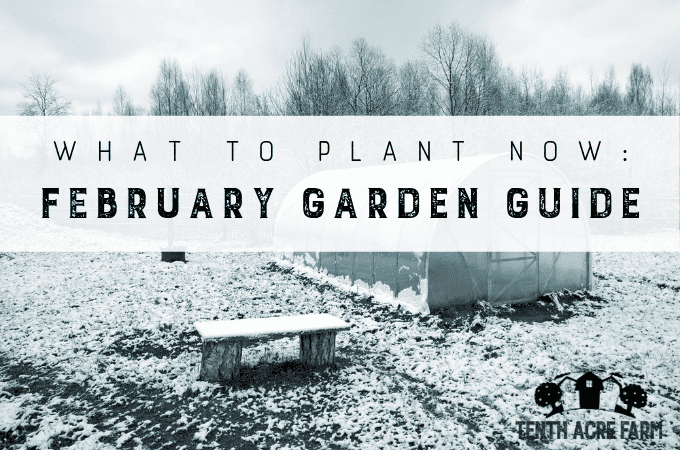 In the January Garden Guide, we discussed designing our gardens, buying seeds, a few things to harvest from a cold frame or other protected growing space, and a few maintenance tasks if the weather’s right for working outside. February is when I start getting antsy for spring. Like me, your garden may be covered in snow but at least February is the month to collect seed starting supplies and dig in. All in all, February is a fairly tame entry into the gardening season. As an example, this is a sample February calendar based on my gardening year in USDA hardiness zone 6a. You may need to make adjustments for your climate. See below under ‘Garden Planning’ for more ways to adjust this schedule for your needs. Crops that were sown in early fall, covered by row cover, cold frame, hoop house, greenhouse, or some other kind of protection, can be harvested throughout the winter. 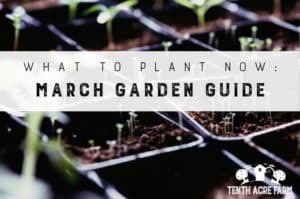 While you may still be deciding on what to plant and how much, you can go ahead and get some seeds started both under grow lights and in a cold frame. Don’t forget I’m gardening in USDA hardiness zone 6a – you may need to make adjustments for your climate. The following seeds can be started indoors. For details about starting seeds indoors, see my step-by-step guide. The American flag leek variety has never steered me wrong. For an onion that stores long into winter, try the sweet Spanish yellow onion. It will work well in zone 6 or colder. Warmer growing zones should have good luck with red creole onion. Try the De Ciccio broccoli variety. It is an heirloom variety that will continue producing side shoots all season, long after the main head has been harvested. I couldn’t grow a garden without kale, and I love all varieties. But my garden wouldn’t be complete without Lacinato kale. AKA dinosaur kale, this heirloom variety has flat leaves that are easy to clean. Do you have enough bright orange in your garden? I bet not 🙂 Try the Orange Sun sweet pepper and bring cheer to your garden and kitchen. When you purchase my award-winning book, The Suburban Micro-Farm, you get four garden planning tools as a bonus, including my Seedstarting & Planting Worksheet, that will AUTOMATICALLY GENERATE all of your planting dates based on your frost date. Amazing! If you’ve got a cold frame, this is the month to get stuff growing! If I didn’t get to these tasks in January, I try to complete them this month. Add soil amendments to inactive gardens with a digging fork. Add soil amendments like finished compost, worm castings, fresh or dried herbs, or aged manure. See my article 9 Organic Amendments that Improve Soil for more ideas. Cover beds with a deep mulch. I like shredded leaf mulch because it’s free, but chemical-free straw is good, too [Note: Most straw is laden with pesticides.]. For more of my mulching tips, see Mulching in the Permaculture Garden. Build a new garden bed! If the February weather allows, try building a new bed using the sheet mulch method. Sheet mulching is an easy way to convert grass to vegetable beds. 1. I covered an area with cardboard, making sure to overlap the ends to cover the ground completely. 2. I added organic matter – compost soil, coffee grounds, worm castings, aged manure, etc. The minimum rule for the thickness of the organic matter is 12 inches, but go thicker if you have access to enough organic matter. 3. I covered the new bed with a cold frame. This allows me to get a jump on the season and sow a few crops earlier than I might have otherwise. That’s it, congratulations on a great start to the gardening season! What did I miss? What do you do in February in your climate? Are you going to put your broccoli in a cold frame? I’m growing broccoli this year for the first time in forever, but I wasn’t planning to start them for a couple more weeks. I’m not using any season extenders this year, though. TY for the reminder. Getting my lights ready as we speak, only a few more days to start if going by the moon planting. Have the broccoli/onions in a make shift cold frame, ready to plant in the beds, just waiting for this last storm to pass. Thankfully last week was the soil. So it’s great to have you send these articles to check in with everyone, keeping us reminded to stay on schedule. TY so much. Happy gardening. PS, love what you did with your front yard. I will probably just use row cover for the broccoli, but if I had a few more cold frames I would use them! What a great list. We’re doing much of the same (zone 9). Our average last frost date is Feb. 15th but we don’t usually plant until the first week of March. Great post… it is so nice to be thinking of gardening again. 🙂 Thank you. Six months is a safe timeline. Typically manure is mixed with bedding, which speeds up the composting process. If it isn’t, layering the manure with carbon materials – twigs, leaf matter, straw, or wood chips will help speed the process. LOL, smell test for manure 🙂 It amazes me how many people advertise “free manure” on craigslist when they really just mean horse doo… and how many people put that straight on their garden! Thanks for sharing at the HomeAcre hop. Even though we are not able to get in the garden for a quite awhile here it’s great to come and visit someone who is! We live in Michigan and the degree this morning is 6 with a windchill factor of -14 so we are not ready just yet. All your produce sound so good and I hope you have a great gardening season this year. Great post…and I’m so jealous! We’re still buried under snow so there’s nothing to be done here yet. 1 more month to go. I can’t wait to get started too. Your February sounds like our April! In February, I usually alternate between more planning, and cursing everyone in warmer zones posting pictures of and talking about all they can do already. Lol. When we get nice days, which happens sporadically, I can get out and do some clean up, maybe some soil prep. This year I’ve been digging out some rock the previous owners mulches with on the side of our house. We’ll be putting in raised Hugelkultur beds in that spot. Ha! Yes, that winter weather can really spoil the fun sometimes. We alternate between mild winters and harsher winters. This one seems about average, so technically I could be getting a lot more done! It’s February, I have 3 feet of snow in my yard, 45 mph winds and more snow on the way. A cold frame would have collapsed due to wind and snow. My ground won’t be clear until March if I’m lucky. What you can do in February depends entirely on where you live. Exactly. That’s why it says above, “Remember that I’m in USDA hardiness zone 6a, which may or may not apply to your location.” I hope it’s warm and cozy for you inside! Soooo jealous! Not because of where I live, but because we aren’t going to to be gardening this year. We’re going to be building a house instead, so I guess the trade off is worth it. But right now, there’s nothing to be done for the house, and I COULD be garden planning, If I was going to be gardening. Ah well. Next year…. First things first 🙂 Although this is the typical plan I use, I won’t be gardening this year either as we set up our new homestead. It’s not a homestead without the home! Couldn’t find a way to respond in your personal welcome letter. Am here as an audience or observer as I did this same thing in 1980, quit my teaching job to be a fulltime mom, wife and gardener. To literally put food on the table from our suburban lot. Will be fun for me to compare our journeys in a pre and post social media world.By the way, in zone 5 or 6, winter sowing of spinach can occur on ,Sept.28, my daughter’s birthday. I was out in the cold frame, ten days overdue, sowing it sideways off my body and also in labor….Looking forward to this exchange. My garden is on hold this year as I’m converting it into a greenhouse/hoop house. Because the bed alignment is going to be somewhat altered, I don’t want to run into problems between the growing plants and the construction that will be taking place. It’s the first time in 10 years I won’t have a spring garden, but I’m looking forward to being able to plant a fall crop at least once the build phase is completed.